This week news developed that a racism row was hitting the Chinese Super League. This is the first investigation into racism that we have observed in the CSL and is of course very disappointing for all involved. 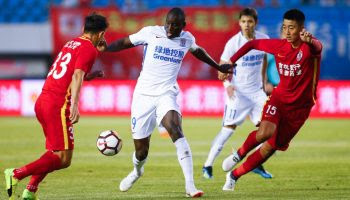 The incident in question that caused this row took place last week in a game between Changchun Yatai and Shanghai Shenhua. It was alleged after the game by Wu Jingui the coach for Shanghai Shenhua that Demba Ba suffered racist abuse. As Ba's coach said after the game "I learned that a Yatai player used insulting language toward him [Ba]. Around the world, it has been stressed that there should be no insulting speech toward black athletes. The Chinese Super League has players of many different skin colours. We should respect our opponents and there should be no discrimination." During the game, it was hard to see what had happened as Demba Ba collided with an opponent. It looked like another clash that happens during many games around the world. What made this one different however the striker grew visibly upset with Changchun midfielder Zhang Li. At the time you can only assume the referee did not hear anything as he booked both players involved. This was not to be the end of it as the truth of the incident came out the Chinese Football Association launched an investigation. This being the first time the CFA had launched such inquiry there was always going to be problems. This was seen with the Chinese media standing up for their countryman Zhang Li. The media then produced photos of Li joking around with team-mates of different races. When tactics like this are used to try and prove someone is not racist you can tell they are fighting a losing battle. It now looks like the media were ill-informed to produce such stories with the Changchun Yatai midfielder Zhang Li has been for six games on top of a 42,000 yuan (£4,800) fine. The official line from the CFA, however, seems to stay clear of the 'race' word as they said on Li's actions "(they) interfered with the normal order of the game, causing chaos and adverse social impact". What was in fact said will most probably never come out but hopefully the player and the CFA have learnt from it and we do not hear any more negative stories come up.